Anybody got any info on Harulder Ingolfson or whatever his name was. That jaffa cake striker what was his name? Another one with horrendous injuries if I recall correctly! Just seen a photo of Josh Maggenis. He looks like an upside down Jaffa cake now. Looks like a Sisqo tribute act. Was in the paper the other day saying the league in Kazakhstan was far superior to anything in Scotland. Like I'm going to believe it when this trumpet is getting a game every week. Saw him chain smoking outside and falling about inside the Snuggery a few weeks back. Seems to be a coach in Iceland? Think D'Jaffo was last spotted working as an agent. Gary Dempsey is a youth coach in Ireland these days surely. Still can't believe JC thought it would be a good idea to play him wide left. Dempsey was a good player. Like Touzani, a bit slow. Severin and Nicholson and the then better Chris Clark kept him out the team a lot. We were a better team then. I'm not disputing he was an OK player. He was not equipped to play left midfield though. But he got on with it and at least tried, unlike several other players who spat the dummy and it was blatantly obvious they wernt trying. I've told you a million times not to do that. Makepeace was worth a dunt. The Dazzler seems to be struggling a bit at USL level. A few starts now, but no goals, and he tends to find himself subbed off for the second half. Maybe still carrying an injury, maybe (as I suspected) the heat is killing him, though Morrison seems to be handling it okay. Anyway, no goals for Mackattack as yet. Darren's actually at a Q&A session at some Library today. Giving his expert opinion of readingisation and literaturising, no doubt. Meet Darren Mackie today at 2:00 PM! The event will be at the North Valley Regional Library - Maricopa County Library District Darren will be answering questions from the audience and talking about what it's like to be a professional athlete. We hope to see you there! He must have watched The Lord of the Rings from beginning to end like twenty times now, making it by far and away the book he hasn't read the most. Mackie. that picture looks like he was clean through, and the 2nd or 3rd touch shinned off him and went too far. Our very own Tsanko Tsvenanov is now assistant coach of the Bulgarian national side. I wonder how much cash this mediocre fucker sucked out of our club, when we could have been developing our own talent at a fraction of the price. If that doesn't look like a junkie chasing down the imaginary impala that stole his crack I dunno what does. Kiriakov would spend the following five years in Scotland, playing for Aberdeen, Airdrieonians (only five months) and Raith Rovers. 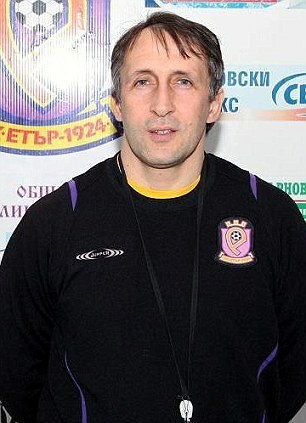 He finished his career in June 2003 at nearly 36: after a brief spell with lowly Akademik Svishtov, he retired at Etar, his first club (now dead, the club al la Rangers). In May 2013, the team was practically dissolved and Etar's remaining A PFG opponents were awarded 3:0 wins by default until the end of the season. Some day I hope the SFA advance to this level. did we sign that ginger idiot because he had one good game in Europe against a start of the season fat gazza? it felt like it at the time. I remember watching him at euro 96 and couldn't believe he was joining us. He really was brilliant! Right up until his Aberdeen debut!! He never played for Airdrie and Raith did he? ?